Aquaponic is a farming technology that combines fish raising and plant growing. It can be one of the ways to reduce the pollution resulting from fish farming by using the water to irrigate plants with a minimal input and effective water saving. In fish farming, generally the fish wastes accumulates in the water and increases pollution if not the water is not circulated properly. However, in an aquaponic system, the fish waste is fed to the plants to be naturally converted to nitrate and nitrite, which can be utilized by the plants as a nutrient source. The relatively cleaned water can be recirculated in the pond, which makes it a closed system and water saver. Fish waste, which is unused and often produces unpleasant odor, can be come a fertilizer for plants. In addition to the waste, the un eaten fish food is also used to enrich the fertile solution. The basic principle for this system is providing optimal solutions for the commodities (fish and plants) by water recirculation. This can become one of the answers to the shrinking agriculture land problem and efficient water usage. 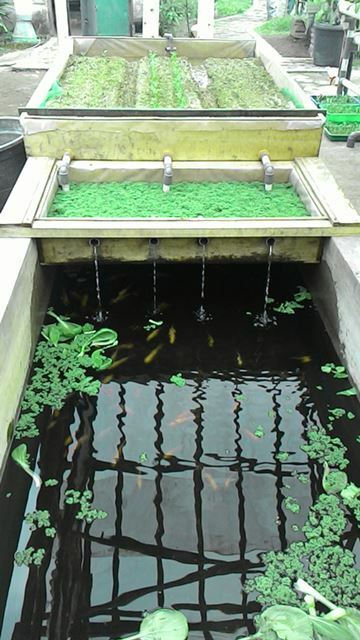 This land and water saving technology can support all kinds of fish and vegetables. The disadvatages of aquaponic consist of high initial investment for the system and the kind of vegetables that can be grown based on the type of fish. Additional fertilizer is not needed in the aquaponic system because the plants receive nutrients from fish and feed wastes. The fish can be fed with commercially availble pellets and supplemented with red azolla (Azolla pinnata), which can easily be obtained from rice fields. The media for this system can be from rice husk, beach sand, zeolite, gravel, etc. There are many kinds of vegetables for aquaponic. Divided into leafy and fruit vegebles, we have grown kangkung (water spinach), caisim, pak-choy, green/red-leaf lettuce, tomato, eggplant, and mint. Catfish is one of the best fish for this technology because it produces the most waste. However, nile tilapia (nila) is also popular choice. This applied technology can become the model for urban farming because it optimizes the use of space and water. With the right development, it can produce substantial harvests, which will it not only improve a home setting, but also add income to the family.